The Irish Church was largely independent of the structure and influence of Rome; hence it developed along its own, idiosyncratic lines. At the heart of the Irish Church were the Irish Monasteries, which served as the center of both religious and social life in Ireland. The typical monastery was like a small village, with huts and small houses surrounding the central church. Here the Irish monks dedicated themselves to the preservation of western classical learning. In the 12th century, the great European monastic orders were introduced to Ireland: the Cistercians, Franciscans, Dominicans, and Augustinians built enormous monasteries, abbeys, and priories throughout Ireland. Cromwell's razing of the Irish countryside and the Catholic church in the 17th century destroyed many of these buildings, but their ruins remain today--evidence of an Ireland that is no longer. Inisfallen Abbey, founded in the early 7th century. 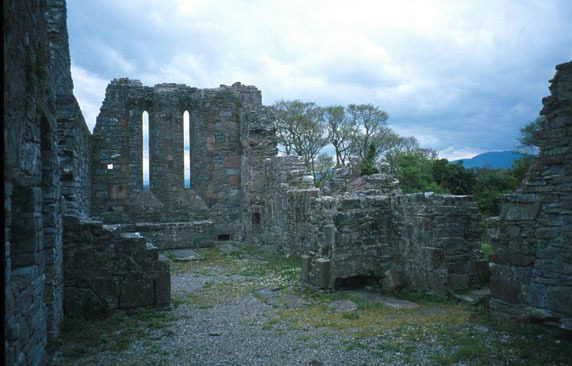 Located on a small island in the middle of Lough Leane, Co. Kerry, the Abbey is one of the great seats of Irish learning. Here the "Annals of Inisfallen," one of the crucial texts of early Irish history, was composed. Most of the current ruins date to the 12th century, but some much earlier remains can be found.